The medieval centre of Edinburgh is constructed on a hill crowned by a fairytale castle. Dozens of stone staircases in narrow passageways ascend the hill. These staircases inspired the lace panel which decorates these simple socks. The winding way pattern is available as an individual pattern download, or as part of Handmade in the UK. 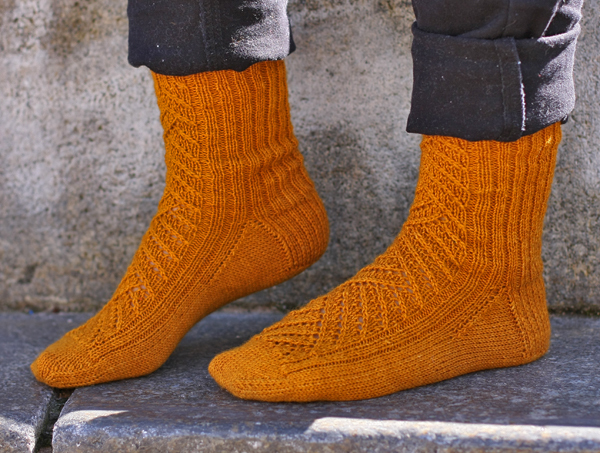 notes Sock is knit top down from cuff to toe, with slip-stitch pattern on heel flap.